Officially licensed replica from The Hobbit film series. This Staff of Gandalf is cast in hard poly resin with an intricately hand-painted finish by skilled artisans. It is cast and painted to exactly match the actual filming prop used in the motion picture series. The 73" staff culminates in a crown that houses a hollow, lattice-shaped bulb that in the film possessed great power. 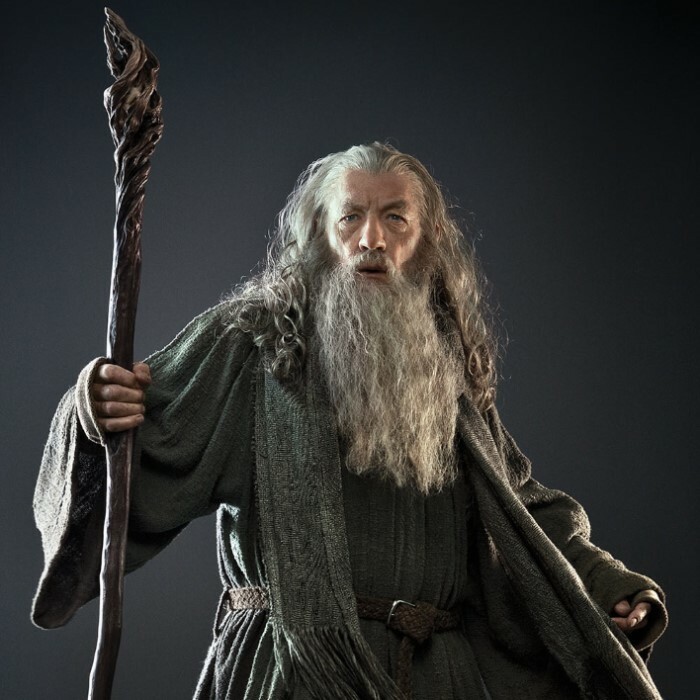 Gandalf used it to illuminate his path in the darkness, ignite fires, shatter stone, etc. It comes to you with a wall mount for display and a Certificate of Authenticity. Well done Mr. Kennesaw on all counts!!! Shipping time was outstanding, with the order arriving before the e-mail advising me that the order had shipped, and that is FAST!!!! As to Gandalf's staff, this was the most securely packaged LOTR item I've ever ordered (and I have both LOTR's shields!!!) Likewise, it is the heaviest of the items as well, with attention to detail impeccable (those black spots on the lower staff portion are intentional....don't forget, this was so it would appear perfect to a CAMERA!! I also suspect that this staff is actually heavier than the one used in the movies, as I am 66 years old and couldn't wave this thing around without self injury or, even worse, injuring anyone I might accidently hit, as it w3eighs in at almost 7 1/2 lbs!!!! Of the 3 staffs from the movie series, this one is the best by far and a must have for a LOTF fan. Outstanding, Bud K, simply outstanding!!! 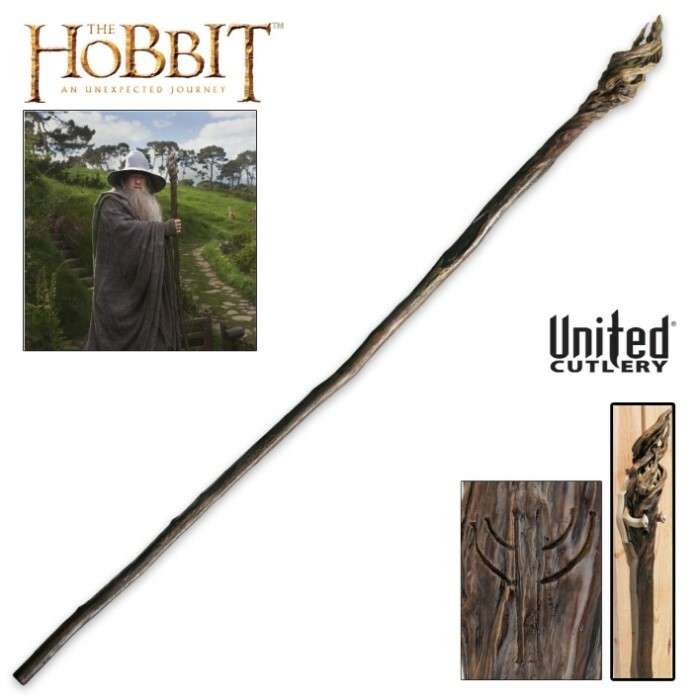 This is the staff I had wished they had released for LOTR, but better late than never. It really is an excellent reproduction. Unlike the "White" staff, it is all in one piece. The shipping box is enormous. 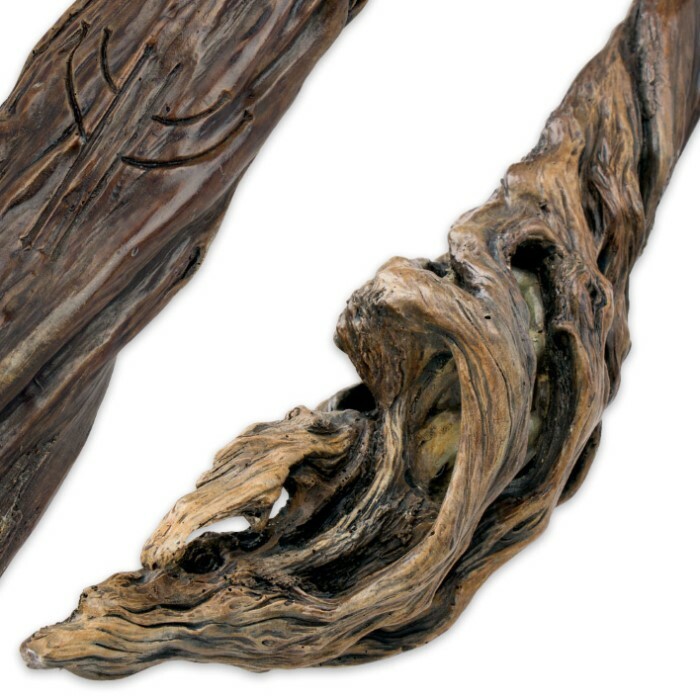 It really looks like wood, but when you grasp it, it feels very cold and hard, like stone. It is also quite heavy. You have to look very close to see the double G rune. Just as one might imagine a wizards staff... mystical. There is also the certificate, which has a copy of the Dwarves map on very heavy parchment-like stock,on the reverse side. Fast shipping. Very heavy staff. The staff has lots of detail on the top. The bottom half is another story. Mine had these shiny black paint smudges on the lower half in random places. Not sure if its intentional or not? Maybe goblin blood? The box it comes in is huge. Wall mount is well made, and has black foam padding built in where it holds the staff. C.O.A is rolled up, not folded. Staff info on one side, map on the other side & stamp on bottom of staff. Paint strokes and machining marks are visible. Same marks that are on the tooth of Orcrist.